The last year has brought Rochester a good selection of establishments that have pushed the envelope in the food scene in different ways from authentic Neopolitan pizza to a reclaimed, renovated Culver Armory and the rise of food trucks. 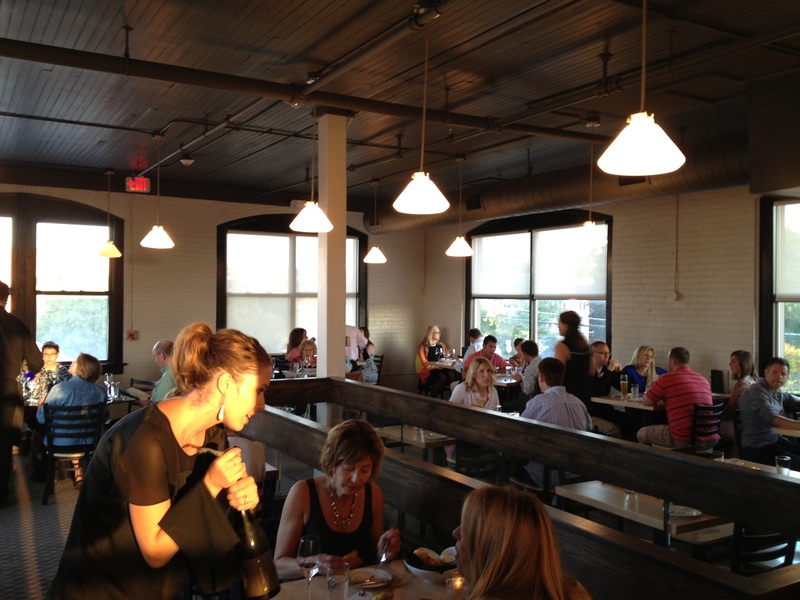 Now The Revelry has come on the scene with a beautiful new restaurant focusing on the trendy upscale Lowcountry Southern cuisine and it’s a great fit for both the neighborhood and the building it inhabits. I never really noticed the building next to Pomodoro on University before the opening, but now that it is has been spruced up with a modern arched sign it really pops as a cross between the old and new. 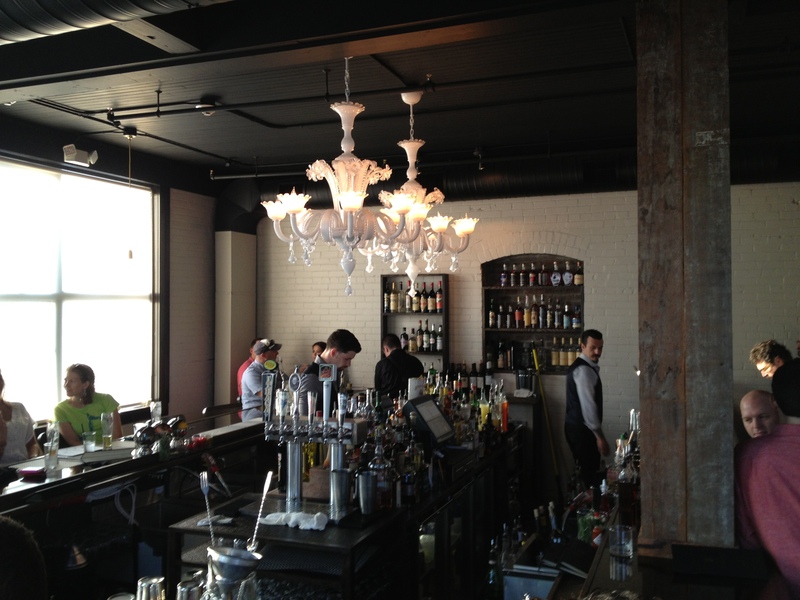 Entering the front door, the bar area really popped with an ornate chandelier and nattily dressed bartenders with top notch facial hair. The bar program seems very well put together and I’ve only heard great things about Jon Karel (from the respected Vera Pizza in Buffalo). We spent our short wait served by the knowledgeable and personable Zack (also from Vera) and drinking a custom made non alcoholic cocktail that was well balanced despite the lack of alcohol in it. A difficult task and he seemed happy for the challenge. Tons of exposed wood was visible throughout the host area and the feel was warm with white brick and black paint to accent the wood. References to the prior incarnation of the building as a sawmill were displayed on the wall which I thought was a nice touch to emphasize the elevated reclaimed feel. 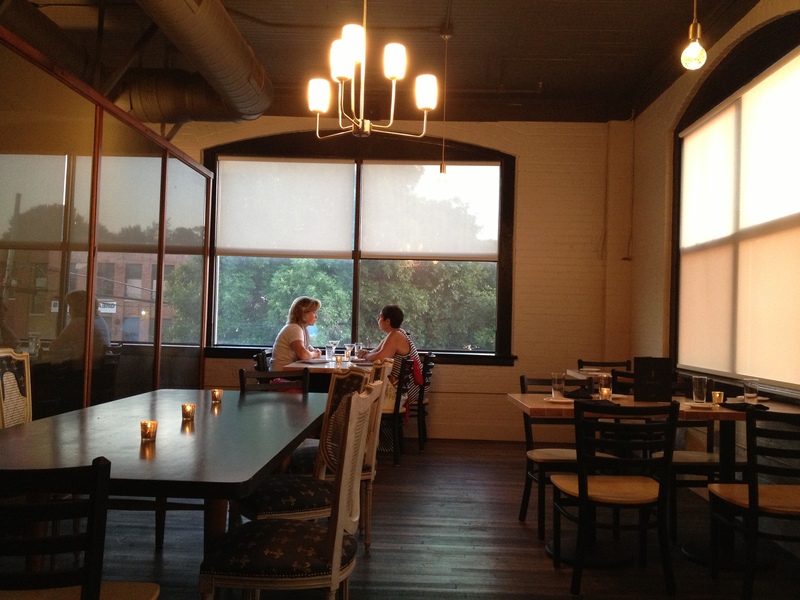 The dining area erred more toward the black and white side but remained comfortable and the service only helped to elevate that feeling. Our waitress and all the servers we interacted with were professional, enthusiastic and knowledgeable about the establishment without being stuffy or overbearing. Very well done! We sat in the small room off the back side of the dining area and got right to our appetizer of fried green tomatoes and crab salad. We did have some bread delivered to us but it was a bit on the cold and unmemorable side and seemed like an afterthought. 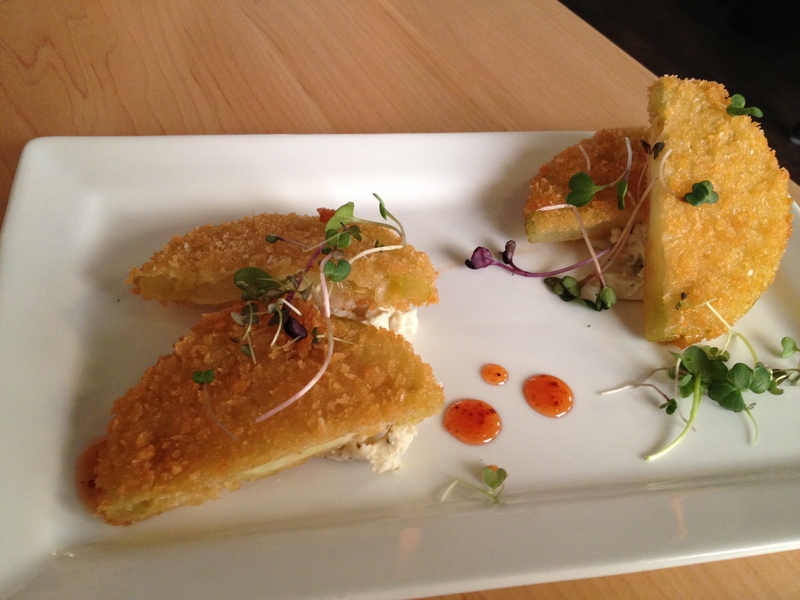 Green tomatoes were coated with panko breadcrumbs and fried crispy on the outside while remaining tender and not overcooked on the inside. Portions are reasonable, but by no means large. The combination of the lightly dressed crab, tomatoes and the sweet sauce that reminded of duck sauce was enjoyable. Our second course was the andouille, shrimp and oyster gumbo and the kitchen, while maintaining presentation, placed our half portions in separate bowls since we were splitting each of the courses. 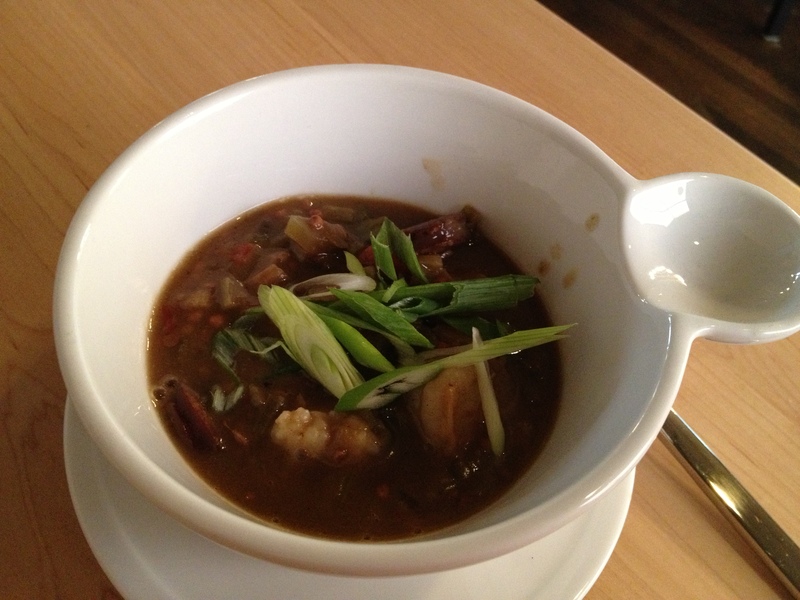 The gumbo was well seasoned without being salty and offered a rich, dark flavor from the roux. Our bowls didn’t have any oysters in them (our server checked and since the soup was pulled from a large pot the ratios of meats weren’t exact) but the shrimp were perfectly tender and the andouille was smoky and just slightly spicy. A solid gumbo and something I’d want to eat again although it appears that it is no longer on the menu. Dry aged duck was our main course served over cheddar cheese grits along with pickled cranberries, pea shoots and a quince duck jus. The duck breast had well rendered, crispy skin, was perfectly tender and the dry aging made sure you knew you were eating duck. 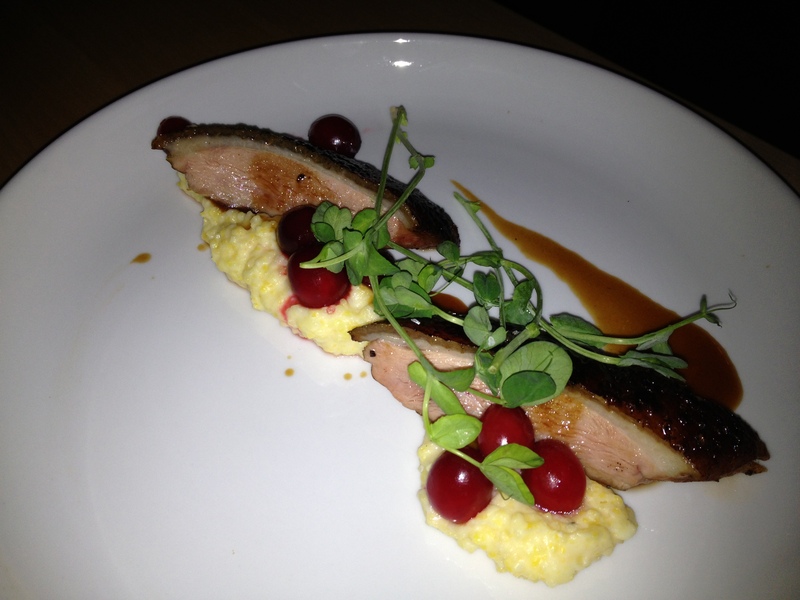 When eaten together, the richness of the smooth grits and duck was complemented by the sharp acidity from the cranberries and the sweetness from the sauce and the pea shoots to make a well balanced and delicious bite. Definitely my favorite course of the night and one that made me want to order duck more often. Dessert was simple and modern; ice cream served with ganache. The classic part was the chocolate ganache with a crunchy crust underneath with ice cream on the side. 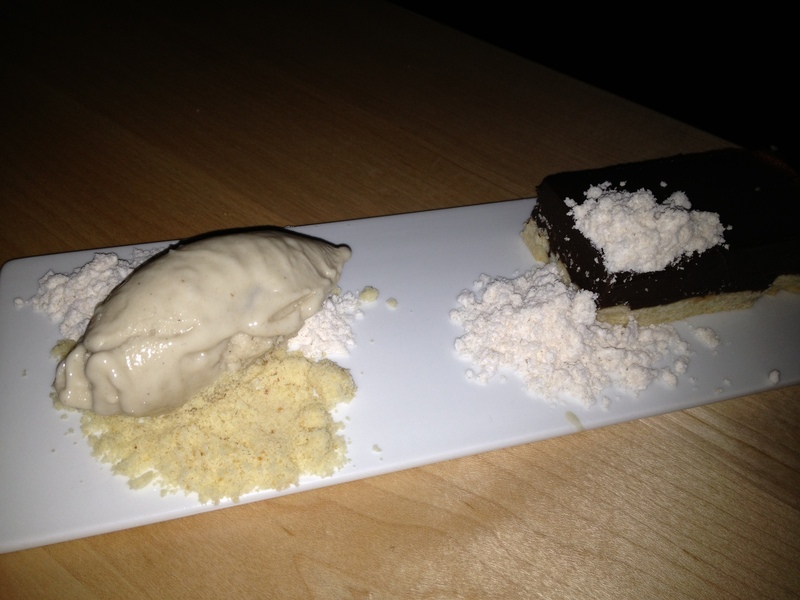 The ice cream was a nice new school roasted banana and the modern kicker was what they called a peanut butter powder. It tasted more like powdered peanut oil from roasted peanuts than peanut butter but combined with the ice cream and ganache the flavors really worked. In total, it was bit too rich for my tastes but my fiancee was a big fan of the rich, dark chocolate ganache and was left wanting more. 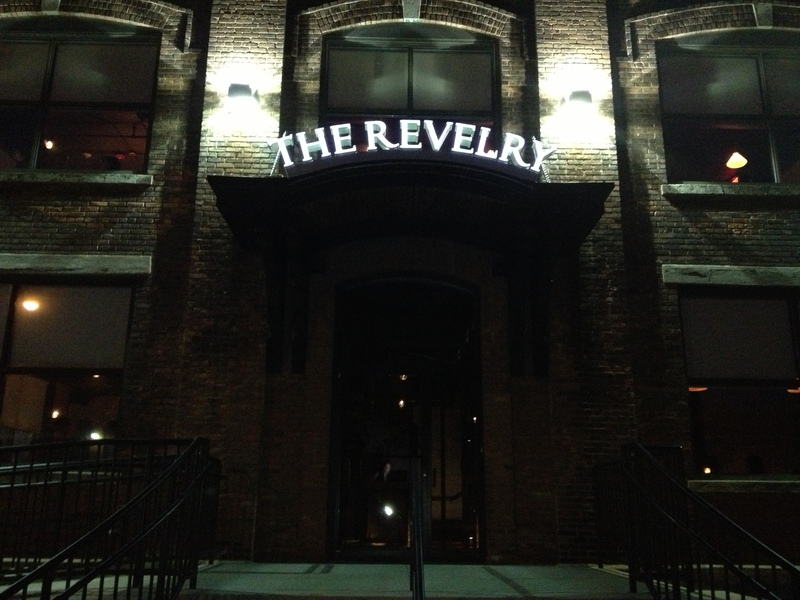 Despite the fact that we were there on opening night, The Revelry showed a level of sophistication both in flavors and in experience that I am looking forward to seeing grow over the years. Consider me a fan and I would highly recommend visiting for a classy night out in the University Ave area.